Decorating the Denver National Bank Building [art original]. This is the first in a series of “Curator’s Corner” posts: a little peek at the history of pieces in our art exhibit, A Visual Rendezvous: the Art Collection of the Western History and Genealogy Department. Guest Curator Deborah Wadsworth will give us the backstory (and maybe some juicy details) for select pieces that are currently on display on the Central Library’s 7th Floor. 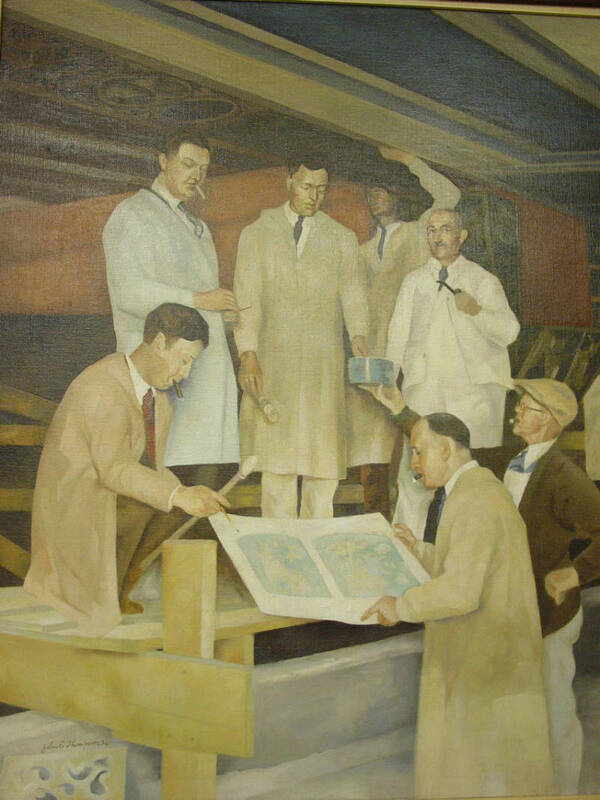 Our first piece is Decorating the Denver National Bank Building by John Edward Thompson (C79-101 ART). When you look at the painting of a group of men gathered around building plans on a construction site, the many interconnections to the Colorado community are not immediately obvious. But this painting has layers of interesting relationships with Colorado history in art, architecture, commerce and technology. The painter was John Edward Thompson (1882-1945), a Buffalo native who spent twelve years in Europe learning his craft and sharpening his resolve through the competition and controversy of the Parisian art scene. He traveled to Colorado during World War I and fell so deeply in love with the state that he settled in Denver for the rest of his life. 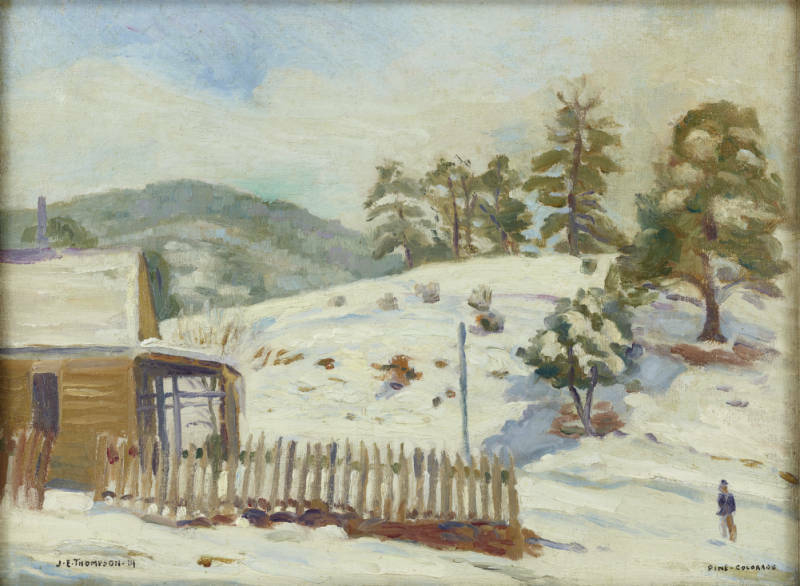 Thompson introduced Modernist painting to Colorado in a controversial show at the Denver Public Library in 1919, known as “Colorado’s Armory Show.” From there, he would go on to influence generations of Colorado artists. The location of this painting was the Denver National Bank at 821 Seventeenth St. 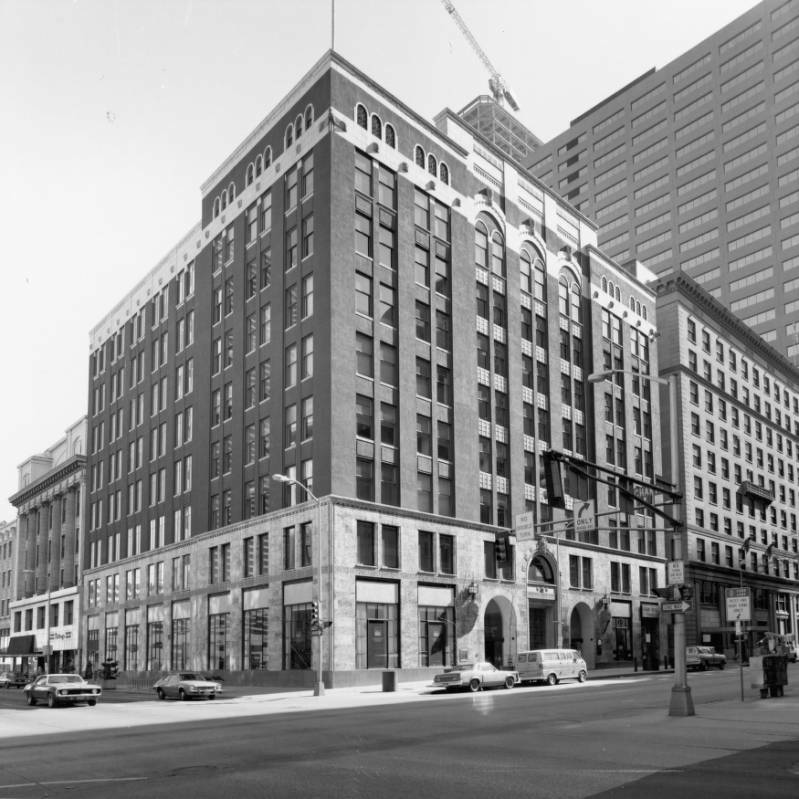 The building was originally built in 1908 as the Ideal Cement Building. At the time, it was the largest reinforced concrete building west of the Mississippi. Charles Boettcher, the owner and one of the founders of the Ideal Cement Company, was said to have ordered the building’s wooden forms to be burned away, rather than torn out, to demonstrate the building’s fire-proof nature. 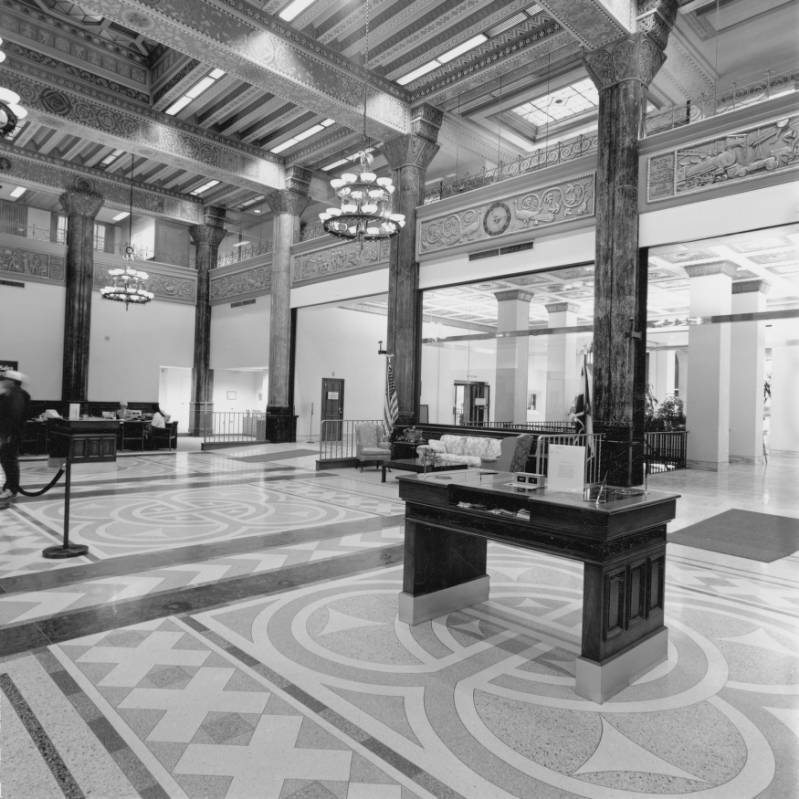 In the 1930’s, the Denver National Bank (with Boettcher as Chairman of the Board) decided to have the building re-designed and expanded. One of Denver’s most distinguished architectural firms, Fisher and Fisher, designed the building based on motifs from Medieval Italian architecture. They hired some of Denver’s most prominent artists to decorate the ornate interiors of the bank. Arnold Ronnebeck sculpted the friezes illustrating the history of money. The magnificent bronze doors, the largest made in America at the time, were the work of Nena de Brennecke. Clare Dieman sculpted the American animals and plants on the doorframes that were executed by the Denver Terra Cotta Company. John Thompson and his atelier designed and painted the murals. Previously the Denver National Bank. Photograph taken by Roger Whiteacre, 1995. Previously the Denver National Bank. Photograph taken by Roger Whiteacre, probably 1990-2000. The bank has gone through various owners over the years. Colorado Business Bank oversaw a comprehensive restoration and renovation of the building with cooperation and assistance from Historic Denver, Inc. The building remains a historic and artistic gem of Colorado architecture. Beyond illustrating these interconnections in Denver history, this painting itself illustrated the multiple goals of the DPL’s art collection: art for art’s sake, historical significance and research pertinence. Like all of the Western art collection, it is available for study by the public. Good to hear from you Deb! We are so lucky to have Deb's skills on this exhibit and these blogs! The text of the post is really interesting - particularly the involvement of the women artists - but the historic photographs accompanying this post are pictures of the Colorado National Bank building, which is kitty-corner from the building that is the subject of this post. Thanks for letting us know, Vicki! The photos have been changed. Thanks for making the changes. The new photos are great!